1. Applications are invited from unmarried Male and unmarried Female Engineering Graduates and also from Widows of Defence Personnel for grant of Short Service Commission (SSC) in the Indian Army in all Arms/Services. Course will commence in Oct 2019 at Officers Training Academy (OTA), Chennai, Tamil Nadu. for SSC/Tech/Men and Women). Candidates who have passed the requisite Engineering Degree course or are in the final year of Engineering Degree course are eligible to apply. Candidates studying in the final year of Engineering degree course should be able to submit proof of passing by 01 Oct 2019 and produce the Engineering Degree Certificate within 12 weeks from the date of commencement of training at Officers Training Academy (OTA), Chennai, Tamil Nadu. Such candidates will be inducted on Additional Bond Basis for recovery of the cost of training at Officers Training Academy (OTA) as notified from time to time as well as stipend and pay & allowances paid. Important Note. 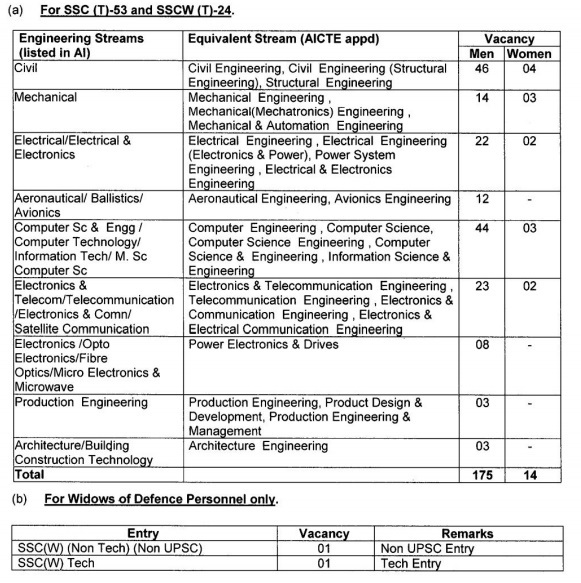 Candidates must note that for induction to Pre Commission Training Academy, after final selection, the minimum educational qualification is passing BE/B.Tech degree in the Engineering streams notified below at Para 3. To become eligible for induction into SSC (T)-53 (Men) and SSC (T)-24 (Women) course at Officers Training Academy (OTA), Chennai, Tamil Nadu, candidates studying in final year of engineering must ensure that he/she submits the proof of passing engineering degree exam by 01 Oct 2019 to Directorate General of Recruiting, failing which his/her candidature will be cancelled. Educational Qualification for Widows of Defence Personnel who Died in Harness. (0) SSCW (Non Tech) (Non UPSC). Graduation in any Discipline. (ii) SSCW(Tech). BE/B Tech in any Engineering stream. Important Note. Candidate studying in final year of Degree must ensure that she submits the proof of passing Degree exam by 01 Oct 2019 to Directorate General of Recruiting, failing which her candidature will be cancelled. (i) For SSC(T)-53 Men and SSCW(T) 24 Women. 20 to 27 years as on 01 Oct 2019 (Candidates born between 02 Oct 92 and 01 Oct 99, both days inclusive). (ii) For widows of Defence Personnel who Died in Harness Only. SSCW (Non Tech) (Non UPSC and SSCW(Tech) - A maximum of 35 years of age as on 07 Oct 2019. Note. The date of birth entered in the Matriculation/Secondary School Examination Certificate or an equivalent examination certificate only is accepted by this office. No other documents relating to age will be accepted and no subsequent request for its change will be considered or granted. (a) Applications will only be accepted online on website "www.joinindianarmy.nic.in". Click on 'Officer Entry Appln/Login' and then click 'Registration'. Fill the online registration form after reading the instructions carefully. After getting registered, click on 'Apply Online' under Dashboard. A page Officers Selection - 'Eligibility' will open. Then click 'Apply' shown against Short Service Commission Technical Course. A page 'Application Form' will open. Read the instructions carefully and click 'Continue to fill details as required under various segments. Personal information, Communication details, Education details and details of previous SSB. 'Save & Continue' each time before you go to the next segment. After filling details on the last segment, you will move to a page 'Summary' of your information wherein you can check and edit the entries already made. Then click on 'Submit Now only after carefully ascertaining that the correct details have been filled in. Candidates must click 'Submit Now each time they open the application for editing. The candidates are required to take out two copies of their application having Roll Number, 30 minutes after final closure of online application. Important Note 1. No changes to details submitted in online application can be made after closure of application. No representation in this regard shall be entertained. Important Note 2, CGPA/Grades must be converted into Marks as per the formulae adopted by the concerned University for filling 'Marks obtained in Graduation' in online application. Any discrepancy observed at any stage of selection process will lead to cancellation of candidature. (i) One copy of the Print out of application duly signed and affixed with self attested photograph. (ii) Self attested copy of Matriculation/Secondary School Examination certificate or equivalent certificate issued by the concerned Board of education in which date of birth is reflected for proof of date of birth (Admit card/Marksheet/Transfer/Leaving Certificate etc are NOT acceptable for proof of date of birth). (iii) Self attested copy of 12th Class Certificate & Marksheet. (iv) Self attested copy of Engineering Degree/Provisional Degree issued by the university. (v) Self attested copy of Mark sheets of all Semesters. [Revised mark sheets issued by a Board/University after submission of online application by the candidate will not be accepted for shortlisting for this course.] (vi) Certificate issued by the Controller of Examination/Registrar of the concerned University regarding formula for conversion of CGPA/ Grades into marks followed by the University. (vii) A certificate issued by the controller of Exam/Registrar/Dean of the concerned university or Principal of the college regarding cumulative percentage of marks upto 6th semester for Engg Degree coursel 2nd semester for MSc. Computer science/ 8th semester for Architecture. (viii) Certificate from the Principal/Head of the Institution stating that the candidate is in final year and his result will be declared by 154 of the month of commencement of course (for final year appearing candidates). (ix) Declaration by the candidate of final year Engineering degree course that he will submit the proof of passing by 1 of the month of commencement of course to Dte Gen of Rtg, failing which his/her candidature will be cancelled. (c) All certificates as above in original. Originals will be returned after verification at the Services Selection Board itself.